What is freedom? A question of three words to which you can find numerous answers on the papers’ front pages, in history books and theme parks, on crowded beaches and deserted beaches, on the metro, in war cemeteries and in the street. 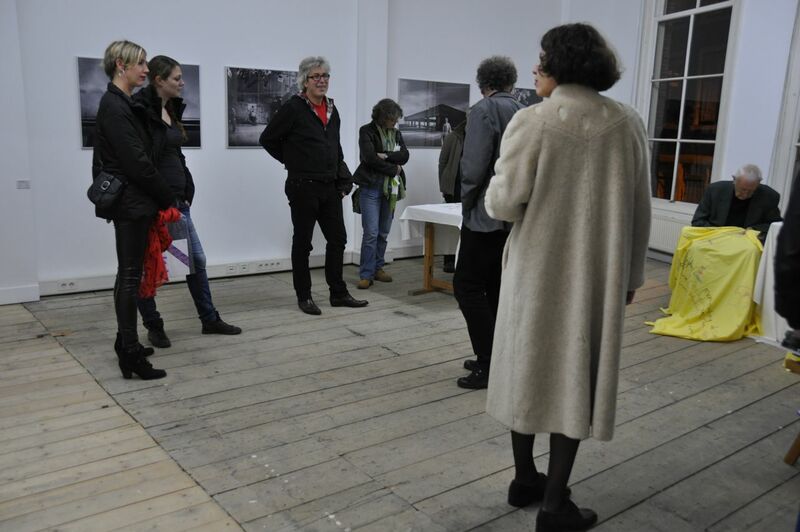 On the near-summer evening of May 5, 2012, about eighty people were sitting at a festively set table in the Beulingstraat in Amsterdam. 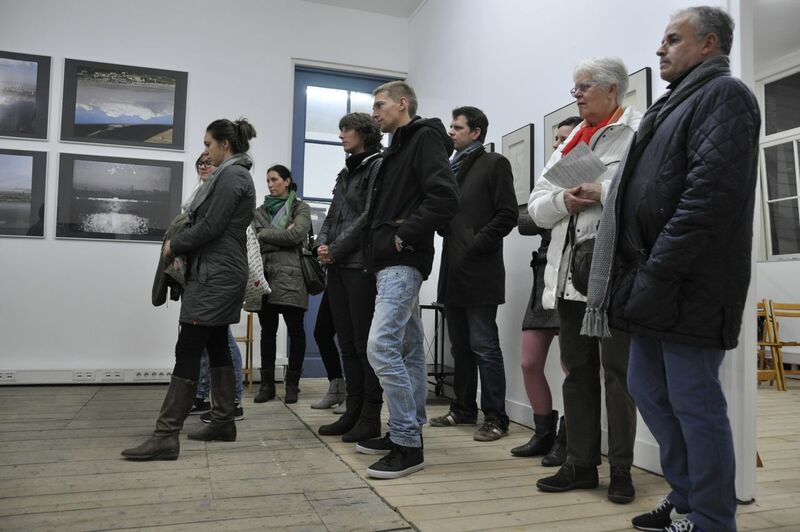 They were right in front of the side door of Castrum Peregrini, a cultural foundation at the Herengracht, that was used by several persons in hiding during WW II when they tried to escape from their secretive lives. Had they been able to look into the future from their windows, they would have seen freedom in the street: a dinner table the length of the alley with merry guests, neighbors’, friends who hadn’t seen each other in a long time and people who got to know each other over dinner. To share a meal in the street, raise your glass high and have a laugh with strangers who become acquaintances – maybe that is freedom. 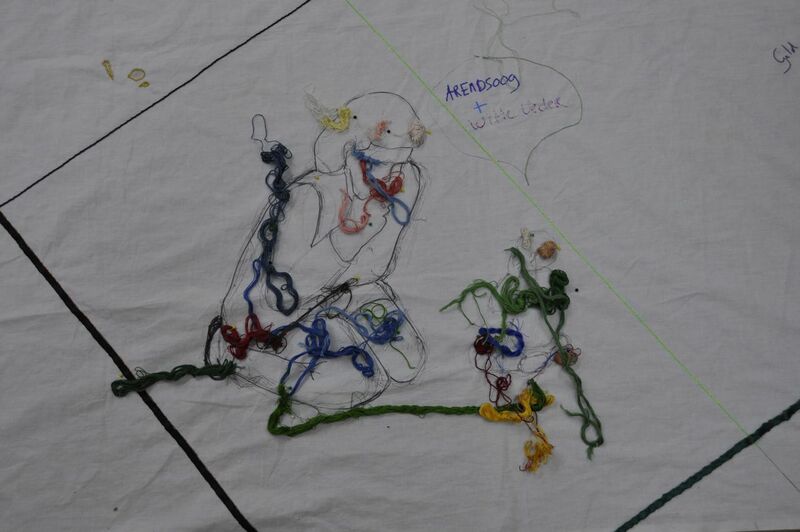 During this Freedom Dinner, visual artist Anne Verhoijsen asked the guests to write down, with textile markers on the tablecloths, what freedom meant to them. A question of three words, but what a question to be asked! Suddenly, clichés seem to be everywhere. Is it even possible to give an original and relevant answer to such an unexpected request? Perhaps sometimes truth can be found in clichés as well? Over dinner and drinks people struck up conversations about freedom. And they wrote. 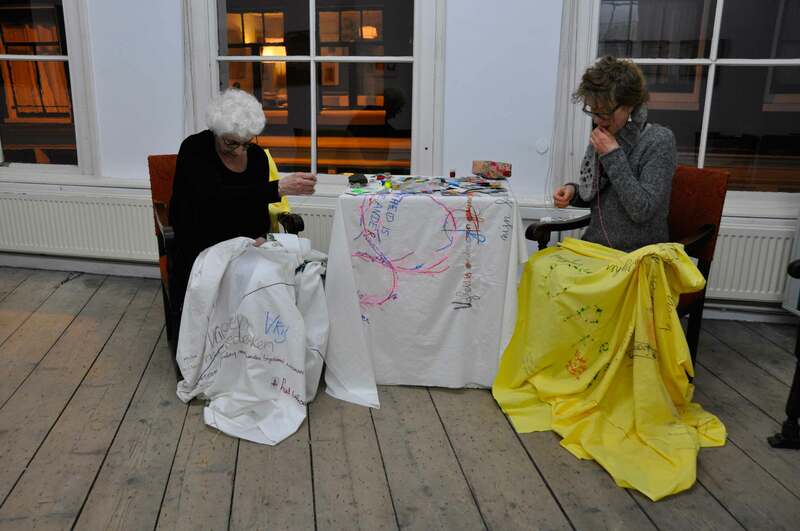 Anne Verhoijsen took home eleven tablecloths with writing, wine stains, remarks, drawings, and fragments of text. She felt the conversation about freedom should continue, that the tablecloths should be embroidered and be used again. 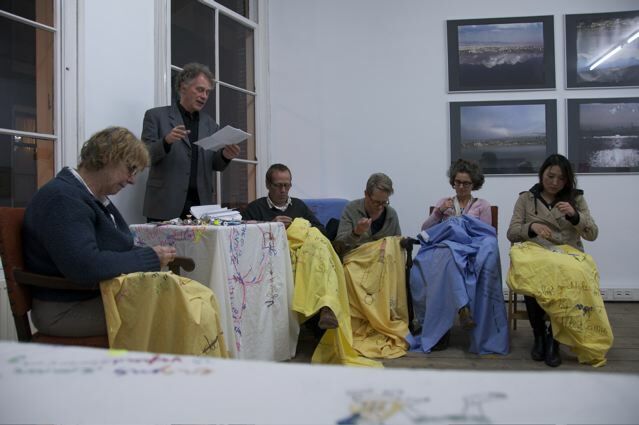 To this end, Verhoijsen brought together fifteen men and women who, stitch by stitch, transformed the writing on the tablecloths into needlework. The word freedom is uttered in a breath; to embroider it takes quite a while longer. Freedom demands a lot of time and attention. Freedom doesn’t come easy, it takes hard work. 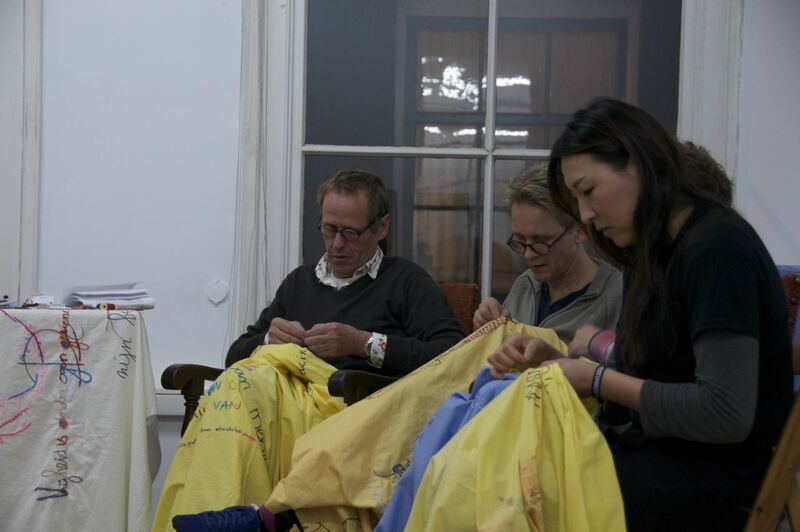 During the Museum Night on November 2, Verhoijsen’s women and men continued embroidering their tablecloths. 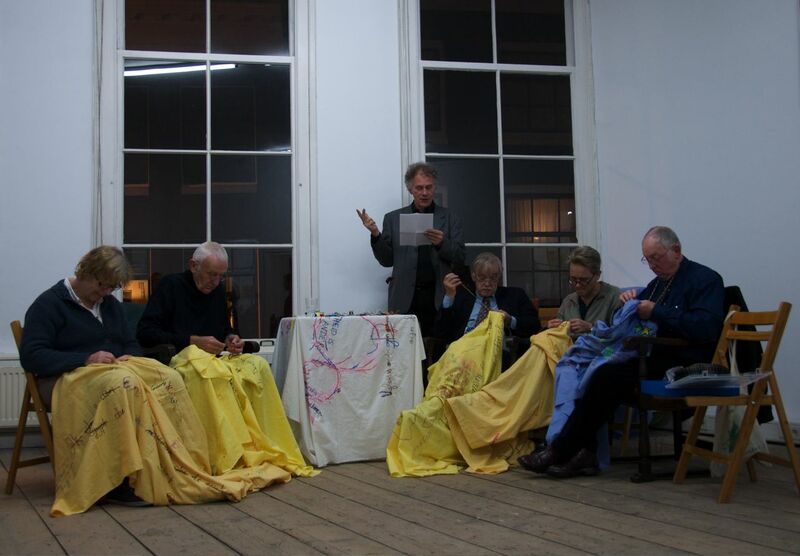 Poet Jos van Hest recited his poem ‘Vrijheid is een woord om te borduren’ (freedom is a word to embroider’) that he wrote especially for this project, taking inspiration from some of the lines he found on the table cloths. 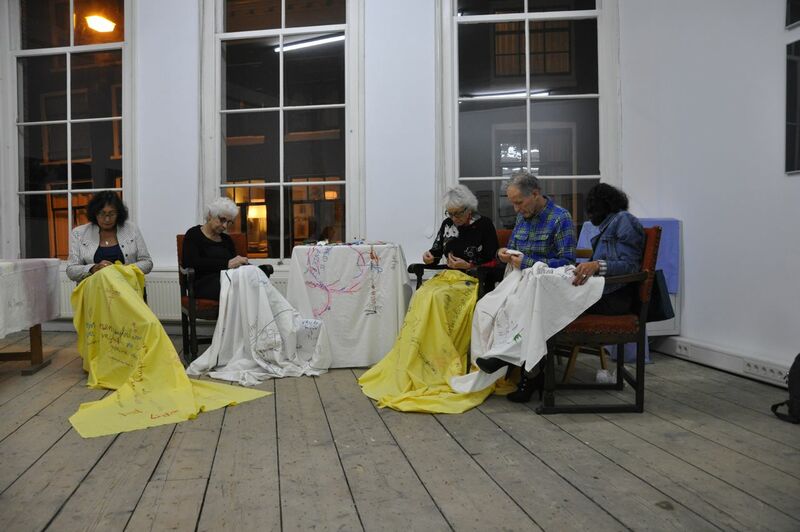 Once the embroidered cloths are finished, they will be exhibited and the whole project will be documented in a publication. Eventually the cloths will be auctioned for a freedom-related charity, so they can be used again. Merry guests will gather round the table, they will eat together, raise their glasses high, read the embroidered texts and start a conversation about freedom. An conversation that should go on forever.